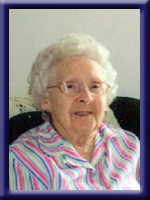 Freeman – Lola Pauline, of Bedford, formerly of Greenfield, passed away peacefully in her 96th year on Wednesday, April 30 in the Abbie Lane Hospital, Halifax. Born in Waterloo, Lunenburg County, she was the youngest daughter of Marcus and Jennie Crouse. Lola graduated from Normal College in Truro and was a well-respected teacher in Lunenburg and Queens County schools. She retired as a grade 3 teacher at the Newcombville Consolidated School. Her greatest joy was teaching and watching her pupils do well. A tireless community worker, she was active in the Greenfield United Baptist Church with Sunday School and Missionary Society and was a life member of the sewing circle. Her embroidered pillow cases were sought after at the craft sales! She was also a member of the Women’s Institute, loved to bowl, work in the garden, read and knit. She and her late husband Hardy had a wide circle of friends in the community with whom they enjoyed many card games and social events. After Hardy’s death in 2004, she moved to Berkeley retirement residence in Bedford to be near her family and enjoyed new friendships and activities there, especially crossword challenges. She is survived by her daughter Judi (Elliot) Hayes of Bedford, granddaughters Stephanie (Mickey) MacDonald of Halifax, Erin (Christopher) Pember of Vancouver. She is also survived by six great grandchildren Sophie, Nicholas, Noelle, Rose, John and Colin; three sisters in law and many nieces and nephews. She was predeceased by her beloved husband Hardy, sisters Eletha and Vella, brothers Curtis, Garth and Ira. Cremation has taken place under the direction of Chandlers’ Funeral Home, Liverpool. A service of celebration of Lola’s life will be held at 2 p.m. on Tuesday, June 10th at the Greenfield United Baptist Church with Reverend Tom Davidson and Reverend Wade Harvey officiating. A reception will follow at the church. Memorial donations may be made to the Greenfield United Baptist Church, the Greenfield Volunteer Fire Department or Pine Rest Cemetery. Online condolences may be made to www.chandlersfuneral.com. The family wishes to thank the staff at 9 Lane for the excellent care during Mom’s last month and also the staff at the Bedford Berkeley Residence for their loving care over the past nine years. To the family of Lola. she was a lovely lady;always ready to give a helping hand. Mrs. Freeman taught me many years ago at the one room schoolhouse in Chelsea. She was a wonderful teacher, strict but fair. Of all the teacher I had, even in high school, she was always my favorite. My sincere condolences to the family on your loss. I was a former pupil of Mrs Freeman and she was one of my favourite teachers in Newcombville Elementary School. She will be missed by all who knew her. Lola wes a dedicated teacher at Newcombville while I was the supervisor.I am sure many students profited by her effort to improve their learning.I remember her as a fine lady. Our sympathy is with you at this time. We know you will miss her as will many other people. You were fortunate to have her in your life for as long as you did. Aunt Lola and Aunt Letty were a big part of the reason I chose teaching as a career. Many lives were positively influenced not only by her teaching in the classroom but also by the way she lived. Unfortunately we will not be able to attend the funeral service because I will be away at that time. I will be thinking of you. Our thoughts and prayers are with you Judi, Elliot and family. I have such fond memories of Lola dated from the time we were teachers at the new Newcombville School when it opened in 1966. It was my first year teaching and Lola and others extended friendship and wisdom to me. I just wanted to send our family sympathies to your family. Lola had been a lifelong friend of my mother Clarice Wile. For many years it was not uncommon for me to pop in to see Mom and Dad and see Lola and Hardy sitting in the living room having a visit discussing past memories and people, current events and plans for the future. Mom and Lola taught together for a number of years at the “New ” school ( Newcombville Elementary) and kept in touch for many years after that. I might add that Lola was one of my all time favourite teachers when I attended that school.Lola and Hardy often attended concerts that Mom was involved in and the “girls” talked on the phone frequently. We even visited Lola several times in the Berkley in Bedford and they continued their contact by phone until Mom became too ill to carry on a conversation.. Dad (Bernie Wile) wanted me to send his sympathies as well.